Excuse Me, Your Job Is Waiting approaches job-hunting from Lynn Grabhorn's philosophy of the astonishing power of feelings introduced to more than half a million readers. 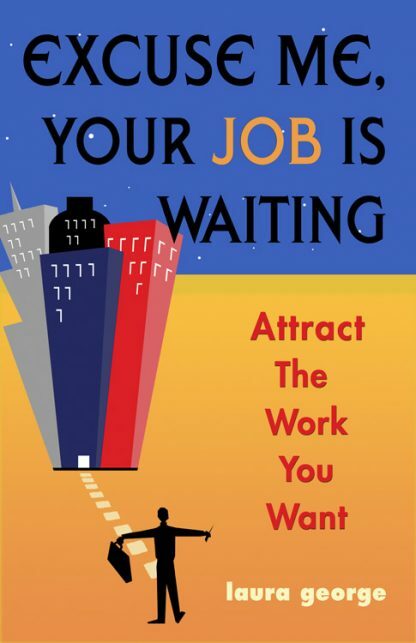 Laura George applies the powerful Law of Attraction to the life experiences of both losing and getting a job. George captures the style and substance of Excuse Me and helps you identify the qualities you want in a job and then shows you how to flip the negative feelings you may be carrying ("the economy is terrible"; "I can't believe I got laid off"; "I'm too old") so you can stay focused and upbeat to draw that perfect job to you. Experienced in job hunting from both sides of the interview table, George understands all the highs and lows in this emotionally draining process. As a job seeker, she teaches you to stay positive after months of few prospects and little hope. As a human resources manager she also knows that these powerful, positive feelings can land seekers the job of their dreams. By exploring the "power of feelings" on your job search, this new job seeker's guide is unlike any other. George shows you the job market through the employer's eyes and offers insider information on r�sum�s and cover letters, internet job boards and on-line applications, interview and salary negotiation strategies, and much more. Future books in this exciting, new "Excuse Me" series will apply Lynn Grabhorn's power of feelings concept to parenting, family relationships, and personal development. Laura George began her human resource management career in 1989 and knows how a "gut" feeling has prompted her to give less than stellar candidates further consideration while by-passing candidates whose presentations looked good. She also know all of the tricks of the trade: how human resource departments weed out resumes with software, how they flush out incorrect data, what kinds of companies advertise globally and hire locally. Her job search knowledge comes from both sides of the human resource desk. As a professional, she has found the world of work to be a revolving door due to "downsizing" more than once. Therefore, George's job search advise comes from hands-on experience as well as her experience in helping many colleagues find employment. George has worked in several industries including small, mid-sized, and Fortune 100 companies with thousands of employees worldwide. I currently own my own consulting company LHG Consulting, Inc. which provides human resource expertise to small businesses in Northeast Ohio.